Date: Friday – Sunday, December 6 – 8, 2019. Time: Friday – 5 to 9 pm and Saturday & Sunday – 4 to 9 pm. a captivating, nighttime historic setting. Catch a glimpse of Christmas past by entering the Historic Mule Stable. The smell of fresh baked treats . . . anise jumbles, ginger snaps and the home baked bread will fill your senses as you pass through the kitchen where mother and daughters plan the sweetest of surprises. Visitors will also enjoy the many Victorian decorations in this historic building that is warmed by the enchantment of candlelight. 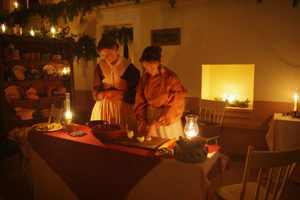 To the delight of young and old alike, interpreters, gaily dressed for the season, will share stories behind Victorian Christmas decorations and traditions as they quill, embroider , and prepare craft items that will fill the giant cedar Christmas tree in the room. Located directly behind The Mule Stable, the Christmas Market features a wide variety of juried crafts and food items. With over 30 stands to shop you can purchase a variety of Christmas gifts and holiday party items. Our Christmas market has ornaments, wreaths, home décor and country craft items, handspun wool products, candles, jewelry, soaps, Christmas cookies, candies, cakes, and cheeses to name just a few of the gifts in our market. Visitors can also purchase tickets for our popular Gift Basket Raffle in our Christmas Market. Baskets which include gift certificates, holiday and home improvement items, gym memberships, family fun activity passes, pet supplies, and ladies & gentleman specialty gifts are donated from area businesses. Valued from $40 to several hundred dollars these baskets can be shared with friends and family during your holiday celebrations. GOOD LUCK! Interested in being a vendor in the Christmas Market? : Click here for market details and vendor registration form. What a better way to get into the Christmas spirit than to take an old fashion wagon ride with your family through the historic Joanna Furnace iron plantation! Rides run continuously though the site that is illuminated with special lighting. 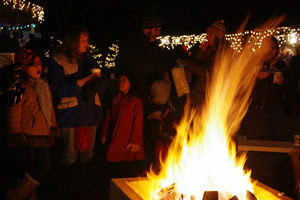 Nestle up by our roaring bonfire and listen to holiday songs sung by Joanna’s Carolers. 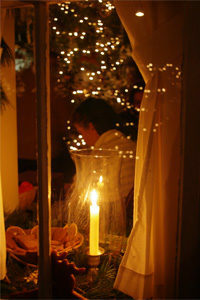 Visitors are encouraged to sing along and enjoy stories of Christmas legends told by our own Ghost of Christmas Present. Beware! Lest you feel the switch of the Belsnickel across your back—if you have not been a good child. However, all “good children” will be rewarded with a sweet treat. Stroll the luminary pathways throughout the Joanna Furnace complex and feel the charm of 1,000 glowing candles. Plus Children of all ages will enjoy walking through our 3,200 square foot light maze on the hillside that overlooks the beautiful glow of the Christmas at Joanna grounds. 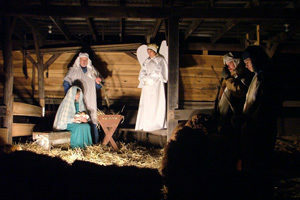 Returning this year to Christmas at Joanna is the live nativity presented by High Point Baptist Church from Geigertown, PA. You will see the live re-enactment of the Nativity of our Lord. So come experience the Christmas Story and make a public witness to the true meaning of Christmas. Learn what it was like to live on an 18th & 19th century iron plantation. Tours will run at 6:15 & 7:15 pm all three nights. Delicious foods and drinks prepared by Hay Creek Valley Historical Association volunteers will be available to purchase throughout the week-end. Items include: Sausage & Meat Ball Sandwiches, Homemade Pork & Sauerkraut, Macaroni & Cheese, Hot Dogs, French Fries, Soup, Chili, Soda, Bottled Water, Coffee, Hot Chocolate, and Hot Mulled Cider. 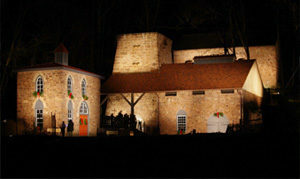 – Convenient parking is located on the Historic Joanna Furnace grounds and along the safely-lit Furnace Road. We are located three miles north of Morgantown on Route 10. Turn at Furnace Road.